If you happen to spot a wild baby rabbit in your yard, your first instinct might be to “rescue” the poor, defenseless creature and care for it in your home. However, to ensure the little bunny’s best chance for survival, the best action you can take is to leave it alone. It is important to note that wild baby rabbits are not suitable pets and should not be thought of as such. Rabbit nests are often built in plain sight, sometimes in the middle of a backyard. They are constructed of fur, grass, and brush. Mother rabbits will only spend a few minutes a day nursing their young; the rest of the day, the babies are on their own in the nest. 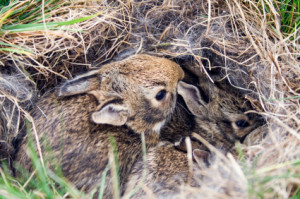 Baby rabbits, or kits, have less chance of survival if they are removed from their nest or if you move the nest elsewhere. That said, if you have already picked up a baby bunny, you can return it to its nest – the sooner, the better. The rabbit mother will still accept the kit even if it has been handled by a human. If the nest is destroyed, you can rebuild it and move the kits into it. You can also move a nest within a few feet of where you found it if it is located in a dangerous spot (such as where a lawnmower is often used). In the case where the mother of the baby bunnies has been killed or there are no signs of her for several days in a row, it is acceptable to call a wildlife rehabilitator. Wildlife rehabilitators have been trained to take care of wild animals that are injured or otherwise cannot care for themselves.